Thanks to the Dailymail and Picturepub. She was last linked to actor Chord Overstreet. 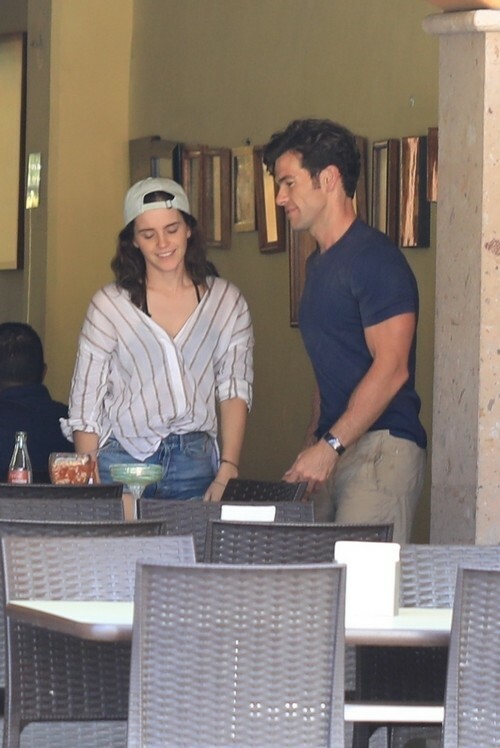 But Emma Watson has clearly moved on, with the actress pictured kissing handsome tech CEO Brendan Wallace during a romantic Mexican vacation on Saturday. With eyes only for one another, they sat across the table, with Emma leaning over to kiss her new man as they talked. He in turn gently held her face as they embraced. After finishing their drinks the pair moved on. Emma was casually dressed for their outing in cut-off jean shorts and a striped shirt, a baseball cap worn backwards over her head. She looks stunning and her legs are gorgeous. Nice combo of a baseball cap and bare legs.